← Attack of the 600 foot Jellyfish! 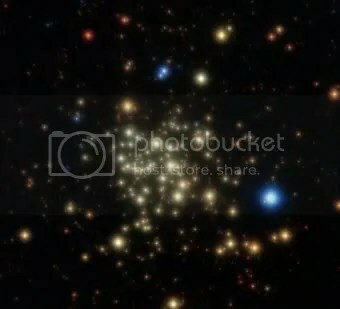 This beautiful little image is of the Arches Star Cluster. Taken recently, using the VLT (Very Large Telescope), it’s the sharpest image ever taken of this ellusive group of stars. You see, the Arches Cluster isn’t easy to see from Earth. It lies roughly 100 light years from the core of the Milky Way, which is really incredibly close. The trouble with anything that close to our old friend Sagittarius A* is that, well, there’s a couple of galactic spiral arms worth of dust and stars in the way. The dust is the troublesome part, obscuring and scattering light (a process astronomers refer to as “extinction”). One quite remarkable thing about the Arches Cluster is that it’s actually the densest known cluster of young stars in the Galaxy! With over a thousand stars per cubic light year (it’s only around three light years in diameter), it makes the term “open cluster” seem slightly ironic. Very roughly, that’s one star every 6000 AU! I think it’s safe to say that if you lived on a planet there, you might not need street lights. Assuming you could live in an ultraviolet flux that potent. These are massive stars we’re talking about. They’re going to be putting out a considerable amount of UV. It’s also just a baby, at a mere 4 million years old. As such, it’s full of short lived but extremely massive stars, with up to 130 solar masses. Stars with this much mass live fast and die young. In other words, fairly soon (at least on astronomical timescales), a lot of them will probably start bursting as supernovae. EDIT– For more info, have a glance at the ESO press release! This entry was posted in Imported from Livejournal and tagged Sagittarius A, star clusters, stars. Bookmark the permalink. 1 Response to My God. It’s full of stars.